Figure A25. Carpentaria anomaly, interpreted as the Carpentaria slab, with (horizontal) [vertical] cross sections through (A)[D] the UUP07 p-wave) and (B)[D] the combined SL2013 and S40RTS s-wave models at 1010 km; C) the location of the modern geological record that we interpret to have formed during the subduction of the slab. The Carpentaria anomaly (Figure A25) corresponds to anomaly A8 of Hall and Spakman, (2002; 2004). It lies in the upper part of the lower mantle below the Gulf of Carpentaria below northern Australia and Papua New Guinea. It lies deeper than the Papua and Arafura slabs that lie shallower in the mantle to the west and east, and which likely subducted since ~45 Ma. This led Hall and Spakman (2002; 2004) to interpret the anomaly as a slab with a pre-middle Eocene age of subduction. 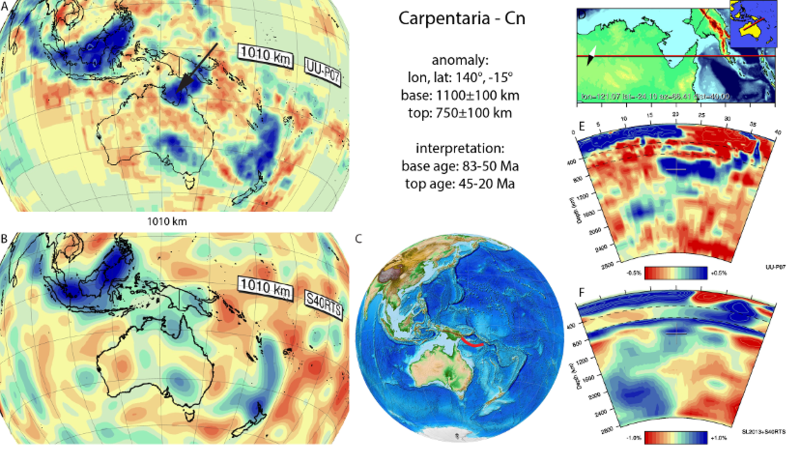 They consequently suggested that he Carpentaria slab may represent Australian plate lithosphere that subducted eastward prior to the polarity switch associated with the onset of subduction of below the Melanesian arc around 45 Ma (see also Gurnis et al., 2000). Hall and Spakman (2002; 2004) suggested a Cretaceous age for the onset of subduction. Based on plate reconstructions of the SW Pacific and southern Pacific ocean basins, Seton et al. (2012) showed that convergence between the Pacific and SW Pacific basins must have occurred since at least 83 Ma, which we adopt as the minimum age for the Carpantaria slab. Wu et al. (2016) interpreted the anomaly to be an East Asian Sea south slab, being the result of southward subduction underneath Papua New Guinea and Solomon Sea between 50-20 Ma. We therefore use an age range of 83-50 and 45-20 Ma for the base and top of the slabs.